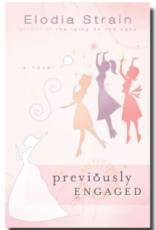 I've been so excited to read Previously Engaged by Elodia Strain. I read Strain's debut novel, The Icing on the Cake, and have been anticipating this sequel. I love Annabelle Pleasanton, the hilarious, quirky, always-getting-out of scrapes main character. She is dating Isaac Matthews, and she gets the feeling that he's going to propose. He asks her ring size and hints that she should get a short lease on an apartment, but Annabelle keeps waiting for it to happen. In the meantime, she wins a $50,000 "Dream Wedding." Although he hasn't technically proposed yet, Annabelle begins to plan her "Dream Wedding." There are a few obstacles keeping her from that dream wedding. First, there's Alex who dumped her at the prom, but seems to have had second thoughts. Then, there's Chloe, Isaac's agent, whom everyone seems to think is perfect for him. There's also the fact that Isaac is not into the high end designer suit and fancy food that her dream wedding require. To top it all off, an amazing job offer threatens to come between Annabelle and Isaac. This is a funny, laugh-out-loud story about a very endearing woman. Through this first-person account, I felt like I really knew Annabelle. Strain's comical and crisp writing style brings the reader into the story like you're listening to your best friend and rooting for her to get out of the awkward situations she manages to get into. Despite Annabelle's penchant for designer bargains, beneath that cashmere sweater, is a huge heart. She writes "Pink Notes" in a notebook which contains lists of people who inspire her. Amongst her "Pink Notes" are women who run a flower business and bakery whose proceeds go to charity. Inside, Annabelle knows what's important in life and it's a fun ride reading as she makes meaningful decisions with that $50,000 she won. I love a story that makes me laugh and inspires me at the same time. Elodia Strain's Previously Engaged is that story. You'll find a well-written book with fleshed-out characters who feel real. Funny dialogue and interior monologue accompany this gem. With her clever writing style, Strain has composed a charming book that makes me want to read the next book she has to offer. This sounds like it will be fun to read! Can't wait! I always enjoy books that can make me laugh too! This one does sound like a cute read. Is it possible for a book to be cute?? Hmmm, I did sigh and smile while reading your review. Sounds like cute to me! It is a very cute read. Although it's a sequel, it is also a stand-alone, and you don't have to have read the first one.